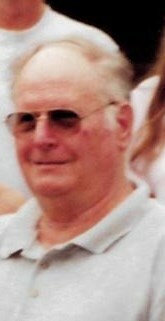 Kenneth R. Powell 88 of Jonesboro died Saturday February 2, 2019 at UI Medical Ball Hospital, Muncie, Indiana. Kenneth was born July 25, 1930 to the late Vernon and Hazel (Campbell) Powell in Logansport, Indiana. He was a veteran having serviced in the US Air Force. He married his wife of 67 years Sharon Wray on August 19, 1951, she preceded him in death September 27, 2018. He enjoyed fixing things, cars and electronics, CB radios and playing games on is tablet. 6 children, Toni Nelson, Jonesboro, Robin Williams, Fairmount, Jacqueline (Russ) Reynolds, Elwood, Jerri (Steve) Hayes, Cicero, John (Norma) Powell, Marion, and Matthew Powell, Jonesboro; brother Robert (Mary) Powell, Logansport, Indiana; 14 grandchildren and 17 great-grandchildren. She was preceded in death by two sons, Mark and Andrew Powell, grandson Chad Powell, 3 brothers and 2 sisters. Services for Kenneth will 12:00 PM Tuesday at College Park Chapel Armes-Hunt Funeral Home and Cremation Services, 4601 S. Western Ave., Marion, Indiana with Rev. Jim Neal officiating. Interment will follow at Grant Memorial Park Cemetery, Marion. The family will receive friends 1 hour prior to the funeral from 11-12.